After a long day of guests are welcomed into relaxation mode, compliments of this luxury Napa hotel. 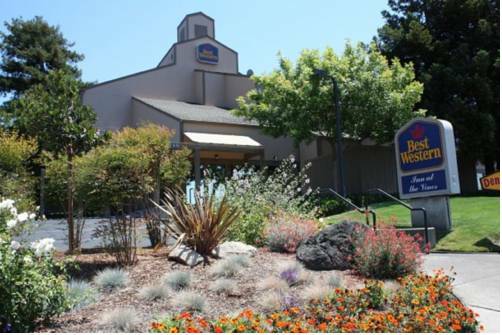 This Napa hotel is a consistent Best Western Award Winner for outstanding quality, design and customer service. Guests enjoy the comforts of the amenities provided which include HDTV's, complimentary Wi-Fi, heated pool and sundeck. Napa Valley is known as a mecca for peaceful getaways, and guests in this hotel are treated to a comfortable getaway close to many highly rated wineries. Enjoy the exceptional service and quality at our Napa lodging. A great value at a great location is a must, especially for guests who plan to tour the multitude of local wineries. The famous vineyards are nearby, but the benefits our guests get also include a close proximity to downtown Napa, Napa Valley Expo, Oxbow Public Market, Napa Valley Wine Train, Uptown Theatre, Blue Note, and JAM Cellars Ballroom. World-famous restaurants are in the neighborhood. Guests who really want to get away from it all can enjoy hot air ballooning over the valley with a champagne brunch. Of course, staying in is another favorite option. Our Napa hotel's workout room features high-quality gym equipment so you can keep up with your daily fitness regimen. Business travelers especially enjoy the great location of our Napa hotel. There are many projects going on in the region, and we regularly welcome contractors of all industries. Medical professionals, wine experts and hospitality pros call this their home away from home and have full use of our business center. Whether you're in wine country for a getaway or on business, you deserve a little spoiling. Relax with high quality linens and enjoy the peace and quiet of your well-appointed room. This Napa hotel is family-friendly, and there are plenty of local attractions for everyone. Our helpful staff is happy to provide recommendations and help you plan the perfect vacation. It's time for your exquisite culinary and wine adventure! Napa General Store: 1.60 mile(s) from Napa General Store, cafe, American, open for: breakfast, lunch, A wonderful cafe with great food, wine tasting, and gift shop. The Napa General Store also offers an ideal space for group brunch, lunch or dinner. Wine tasting - 1.60 mile(s) from Napa General Store, cafe, American, open for: breakfast, lunch, A wonderful cafe with great food, wine tasting, and gift shop. The Napa General Store also offers an ideal space for group brunch, lunch or dinner. From: The south. From Highway 29 take the Napa/Lake Berryessa Exit. Drive two miles, Best Western Plus Inn at the Vines will be on your right. From: The north. From Highway 29 take Imola Avenue Exit, turn left onto Imola Avenue, drive one mile, turn left onto Soscol Avenue. The Best Western Plus Inn at the Vines will be on your right. From: The west. From Highway 121/12 turn left onto Highway 29. Take Imola Avenue Exit, turn right onto Imola Avenue. Drive one mile, turn left onto Soscol Avenue. The Best Western Plus Inn at the Vines will be on your right. CIA at Greystone,21.00 mile(s) from CIA at Greystone, Culinary Institute of America one of the world's most unique and inspiring campuses for culinary education. Napa Valley Wine Train,1.50 mile(s) from Napa Valley Wine Train, is one of the most unique and delicious Napa restaurants.